Many people have food allergies or dietary restrictions. Placing a teal pumpkin outside signals you have non-food items to hand out on Halloween. The Food Allergy Research & Education’s (FARE) Teal Pumpkin Project inspired me to compile this coloring book to be printed and handed out for free. Great for trick-or-treaters or for a favor at a Halloween party! Thank you so much to my artist pals! Support them by buying their art. All artists retain complete copyright over their work. 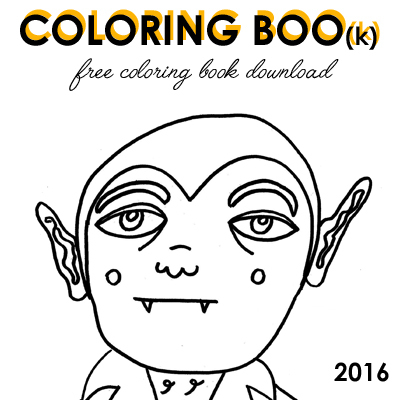 Rhymes with Twee & Friends present: Coloring Boo (2016). 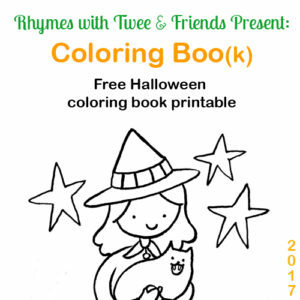 For the second year in a row, I compiled a Halloween Coloring Book. The Food Allergy Research & Education (FARE) started the Teal Pumpkin Project in 2014. Placing a teal pumpkin outside signals you have non-food treats on hand, great for those with food allergies or dietary restrictions. 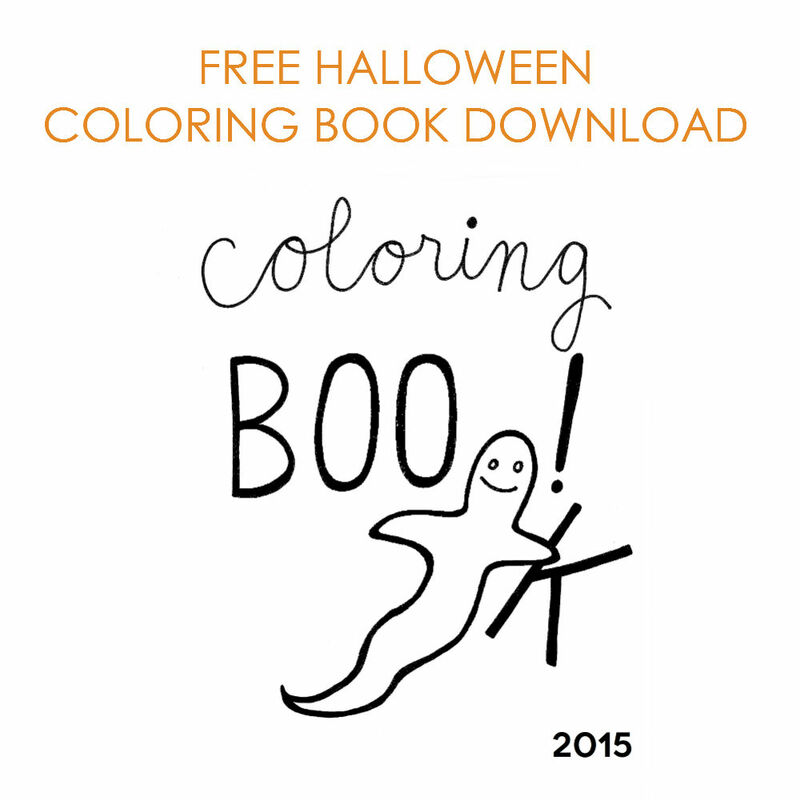 Feel free to print and hand out Coloring Boo to trick-or-treaters or host a coloring party! All artists retain overall copyright of their work. I could not have done this without my artist pals. Thank you! This coloring book is free, but artists retain overall copyright of their work. If you enjoy their work, please support them! 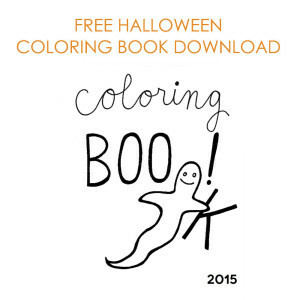 Rhymes with Twee & Friends present: Coloring Boo 2015. I wrangled fellow artist friends across the country for this project. In 2014, Food Allergy Research & Education (FARE) started the Teal Pumpkin Project. A teal pumpkin outside on Halloween signals trick-or-treaters that you have non-food treats for those with food allergies or dietary restrictions. This inspired me to curate and publish a free Halloween coloring book that could be printed and given out to such kids. Enjoy and spread the word! I could not have done this without my artist pals. 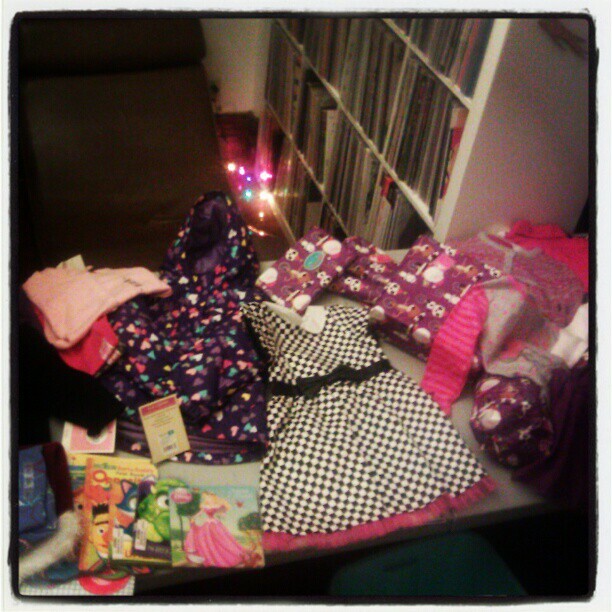 2012 Week 46: One holiday craft fair down, two to go! This week. Celebrated two friends getting engaged. Made brand new products. Had an amazing time at DIY Trunk Show. Went to a vegan bake sale @ Quesadilla. Monday was the 5 year anniversary of Laini’s passing. There is not a day that goes by that I do not think of her. I have a lot of friends, but the bond that I had with Laini was a special one. She was full of boundless energy against all the odds. I am Agnostic, but there are moments when I feel like she is hanging around when there are very happy moments in my life. I feel like if she were around, she would definitely be making something crafty and selling it. She was so freakin’ crafty. OK, tearing up now. I feel like a jerk because I did not call her parents this week, but all the craziness of fair prep left me working late every single night this week. DIY Trunk Show was a win! I love one day craft fairs because I get to take a day off on Sunday to relax after an exhausting day of selling before going back to work the next day. I met so many amazing new customers and got to see old customers. It warmed my heart that one customer bought two bean onesies and one of them was for her future baby who is not yet conceived! When it happens, she is going to use the onesie to show her husband that they are pregnant! How flipping rad is that?! 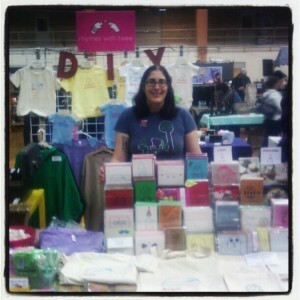 Another thing that made DIY Trunk Show so wonderful was having one of my favorite booth neighbors yet: Christina Ward. Her Etsy shop is here. Coming up next, I have Renegade Craft Fair Holiday Chicago and then Bazaar Bizarre Cleveland. 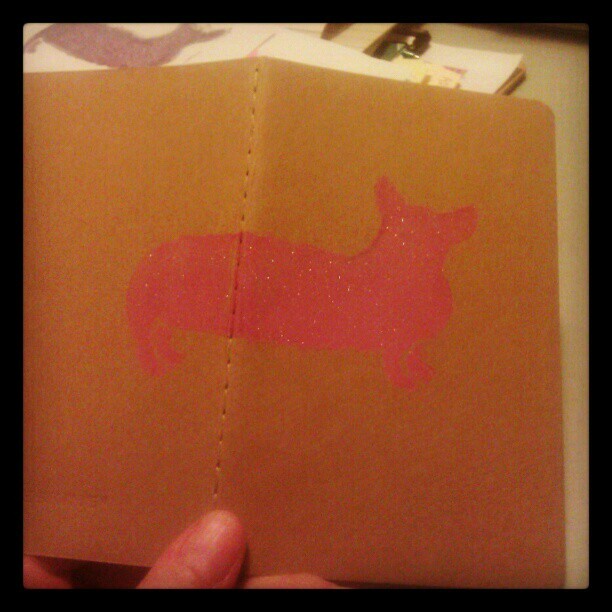 For DIY Trunk Show, I had two brand spanking new items: Chicago Stocking Christmas card and Corgi Ruled Moleskine Notebook (pictured above) and a tote bag featuring my bean design because people totes love totes. More Rhymes with Twee news: one of my longtime loves, Paper Doll, is stocking select Rhymes with Twee cards now. 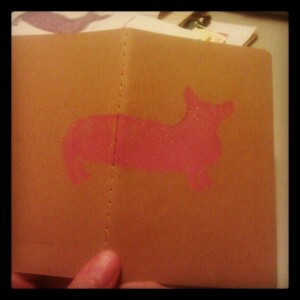 I am super psyched to be selling at Paper Doll because it is my go-to for card buying. I’ve got to say that I am pretty excited that the next time I go in there, my cards will be out! Eek! In The Band That Wouldn’t Die, I kept thinking that the bandleader was super familiar and it turns out he had spoken about Kevin Clash in Being Elmo. I know that more of that story is still churning, but I feel like the whole picture may never come to light. From that documentary, Kevin seemed like a truly good person. Z and I were so tuckered out post-SF that I didn’t even pull it together to write a blog post wrap. San Francisco was mindbogglingly awesome. This is most of what happened. Brianne was the best hostess ever. 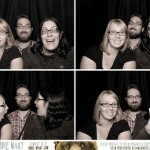 Here is a listing of all we did: Q/Tonga Room with Tim & Sarah. JV showed us Tiny Telephone. La Tacqueria. Mission Pie. Musee Mecanique. Sea Lions. Burma Superstar. Saw Frankenstein @ Paramount Theatre with Amy. Jolie’s. Pacific Pinball Museum. Ch & David’s wedding in Dublin, CA. Rosamunde’s with Sarah, Todd, Juli, & Dan. Indie Mart where we saw White Mystery and Cindy. Ferry Building. The Stinking Rose. Amoeba. Rare Device. Little Chihuahua with Tess. Saw Ultraista at The Independent [meh] with Gavin. Total insanity, dudes. 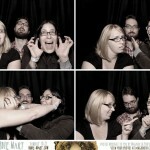 I actually realize that we didn’t get a proper photo with Brianne, but we did get some great photobooth shots! Z and I had our first Halloween party on Friday. Many friends came in costume, which was wonderful. 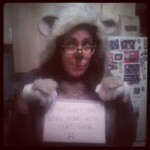 I was Dog Shaming this year, keeping my streak of meme related costumes. I made this amazing buffalo chicken dip. You heard me. Totally gonna try to make a veggie version next time. Also this week: we saw our first wedding venue and it was lovely and a great blank slate, but all the upcharges terrify me. We’ve written probably about 10 places and only 4 have written back. Have a good lead we will be checking out this week. Went to the Commercial Park Halloween Parade with Amy, Kevin, and Beth to hand out candy. Always amazing. Another great thing was that I hired my first TaskRabbit, Ross, to photograph my products. If you did not know, TaskRabbit is a great website where you can find people to bid on running errands/doing jobs for you. I think that other people like me who work a 9-5 job as well as run a craft company should hit up this website. It rules. Totally loved working with Ross and he did a great job. 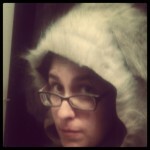 My Etsy is getting a much-needed re-vamp. 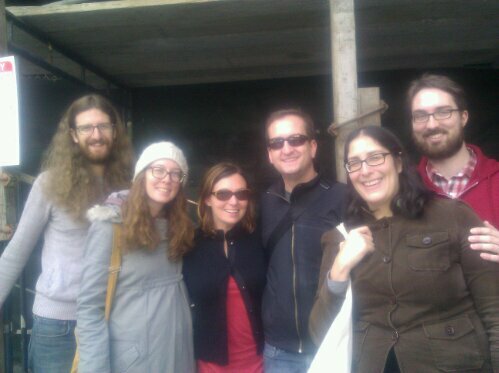 ALSO of note this week: I got to see my MKE buddy Stephanie who I had not seen in ages upon ages and it was excellent. We went to Chicago Diner and chowed down before she headed off to Afghan Whigs. Totally amazing getting to see her. Lastly, one of the best things I did this week was take an SEO class at ICNC hosted by Rod Holmes of Chicago Style SEO. I feel very lucky to have been able to attend this, as before I took the class, SEO was something I only kind of sort of knew about from my friend Sarah. Rod broke it down and answered everyone’s questions. The class taught me that I have A LOT of work to do with helping out Rhymes with Twee’s SEO. They offer you a free evaluation of your site’s SEO. A human being will evaluate your site. For free. Yep. Totally going to do this once I’ve worked through most of my re-vamp. This week is gearing up to be a busy one. Heading out to outside of Indianapolis for my second work tradeshow tomorrow. On Wednesday, I am organizing a work Halloween party. And hopefully we will get to look at that wedding venue I mentioned above. Busy bee. Chronicle and We Bought a Zoo were both a lot of fun. Indie Game was GREAT. Shows that perseverance can pay off. I kept thinking that Edmund’s fiancee–>wife looked familiar and through some googling, I discovered we run in the same crafty lady circles and I remember looking at her livejournal way back in the day. The world is endlessly small. Huzzah! Her Tumblr is really great too. Body Positive + Funny. Chicago friends, reunited and it feels so good. 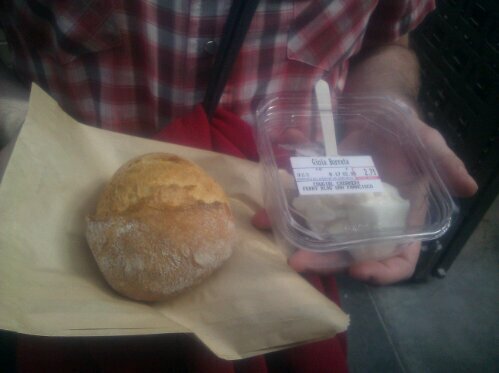 burata from Cowgirl creamery with rustic roll from place next door at ferry building. Once Z and I return from our SF trip, I will do a proper wrap, but for now, here is a taste! My instagram not syncing with my phone otherwise I’d be posting a cute ch & david wedding photo.